While there are numerous island chains around the nation of Greece, its most famous is the group known as the Cyclades. The name ‘Cyclades’ comes from a Greek word which, when translated to English, means ‘circular.’ The Cyclades form a circle around Delos, the sacred island of Greece. Greek mythology says that Poseidon was angry with the Cyclades nymphs, and in a fit of rage, turned them into the islands of today. The Cyclades are in the Aegean Sea and welcome millions of travelers each year, and once you arrive, you’ll understand why. The Cyclades Islands possess some of Greece’s most beautiful scenery, like clean, sandy beaches and whitewashed homes. And the traditional, authentic lifestyle, the charm of the locals, and food that is beyond compare will have you wondering why you never visited before. The island of Ios is home to Managari Beach. A true paradise on earth, the blue waters and beautiful topography are unmatched. The cuisines in any of the seaside eateries is always fresh caught, tossed in Mediterranean olive oils, and seasoned with herbs that have been handpicked. One of the greatest perks of Ios is the laid-back vibe. There is no rush for anything here, just the ability to appreciate what nature has created. 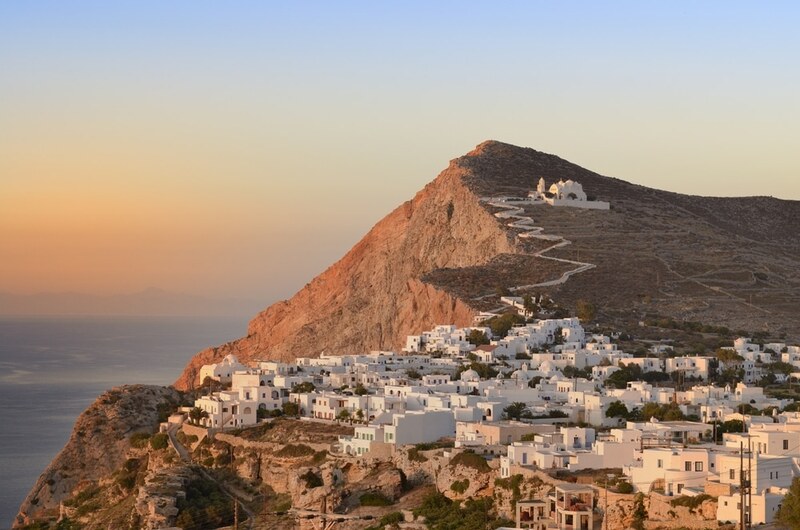 Folegandros Island seems poised to become one of the Cyclades’ most promising destinations. While there is no airport and it’s quite the journey from Athens, this exclusivity makes this one of the most sought-after islands in the chain. In fact, in the center of the island there’s a no-car policy, meaning a much more carefree getaway than if you were rushing to hail a cab, or getting stuck in any kind of traffic. Check out the village of Ano Meria for some true Grecian hospitality. On Amorgos, you’ll enjoy pristine, untouched beaches hugging ancient sandy shores. Some of the major draws of this Cycladic isle are its diving spots, picturesque topography, and hidden caves. Amorgos’ main village town is Chora, and the old streets resemble a welcoming labyrinth. The locals know hospitality, and you’ll be welcomed with open arms as you embrace this isle quite the distance from the beaten path.